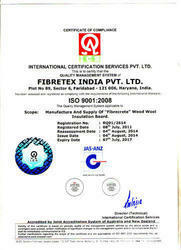 An ISO 9001:2000 certified company, Fibretex India Pvt. Ltd is among the leaders in manufacturing and exporting of Wood Wool Insulation Board, Fibre Ceiling Tile, Sound Insulation Board and many more. With over four decade of experience, we have become a highly reliable and established player in the industry due to our consistent high quality and hard work. We had started as a small cottage industry in 1965-66 at Kolkata, founded by late. Shri. Kanhaiya Lall Bhuwalka. In 1970, our founder planned to specialize in the production of 'Fibrecrete' Wood wool Insulation Board and thus set up the present day industrial outlay at Faridabad, Haryana. Within two three years of it's establishment, the founder implemented the Austrian technology with Austrian Specialists in order to manufacture superior quality boards. Since then there has been no looking back and we have been manufacturing quality products that have created a benchmark in the market. We are exporting our product globally. Mr. Vinay Bhuwalka (Director) has entrusted the firm with latest knowledge and machinery. This helps in maintaining pace with prevailing industrial competition. Periodic interactive sessions are held between superiors and subordinates, which ensure for removal of grievances and streamlined operations at hand. Through his professional skills equilibrium is maintained amongst various processes. Our managing director poses adequate communication skills which help him to get the work done under his terms and conditions. Working of the firm is inspected by him to ensure that production process is not hampered. Quality has always been our prime concern and this has enabled us to be a success story over the years. We are committed to deliver high quality Fibrecrete boards that are durable and easy to install. The boards manufactured by us are a result of high level of efficiency towards achieving total quality standards. Our team of personnels scrutinize each and every stage of production thus ensuring quality products and this strict vigil continues from the procurement of raw materials till delivery. The sound infrastructure of our company has been the true companion in the journey towards success. We have state-of-the-art infrastructure installed at our factory premises involving hi-tech machineries with the cutting edge technology. This high level of machinery enables us to deliver goods that are of superior quality and thus has no substitute in the market. A continuous upgradation is made regarding the condition of the machineries so as to ensure their proper functioning. We are known to deliver quality products that have no match in the market and thus has no near competition. On time delivery of goods have been one factor that we have been known for years. Our products are made with the assistance of Austrian technology thus giving us a cutting edge over our competitors. We always esteem our customers and try to incorporate their suggestions in our products thus resulting in premium quality. We are an ISO 9001:2008 certified company which itself speaks for our quality products. Our main aim is to to maintain leadership both in development and technology of fibrecrete wood wool insulation board by continual improvement in Quality. We also strive to be the first choice of our customers through inbuilt quality that is available at a reasonable price and is safely delivered on time. Our endeavor has been to satisfy our customers by incorporating their valuable suggestions to improve our products. Our mission has always been to deliver high quality products to our customers. We are a dedicated team of professionals who are committed to deliver the best both in terms of quality and technology. Regular training programmes are conducted to upgrade the skills of the personnels so that they deliver the best. Our team members are updated with the latest technological knowhow and knowledge to operate the hi-tech machines thus ensuring higher efficiency. We work in close coordination with each other and thus are able to deliver the best to our customers.